K-278 Komsomolets was the only Project 685 Plavnik nuclear-powered attack submarine of the Soviet Navy. On 4 August 1984 K-278 reached a record submergence depth of 1,020 metres in the Norwegian Sea. The boat sank in 1989 and is currently resting on the floor of the Barents Sea, one mile deep, with its nuclear reactor and two nuclear warheads still on board. The single Project 685 was developed to test technologies for Soviet 4th generation nuclear submarines. Although primarily intended as a developmental model, it was fully combat capable, but sank after a fire broke out in the aft engineering compartment on its first operational patrol. A deep-submergence vehicle (DSV) is a deep-diving manned submarine that is self-propelled. Several navies operate vehicles that can be accurately described as DSVs. DSVs are commonly divided into two types: research DSVs, which are used for exploration and surveying, and DSRVs, which can be used for rescuing the crew of a sunken navy submarine, clandestine (espionage) missions, or both. DSRVs are equipped with docking chambers to allow personnel ingress and egress via a manhole. Ghosts of the Abyss is a 2003 documentary film released by Walt Disney Pictures and Walden Media. It was directed by Academy Award-winning filmmaker James Cameron after his 1997 Oscar-winning film Titanic. During August and September 2001, Cameron and a group of scientists staged an expedition to the wreck of the RMS Titanic, and dived in Russian deep-submersibles to obtain more detailed images than anyone had before. With the help of two small, purpose-built remotely operated vehicles, nicknamed "Jake" and "Elwood", the audience too can see inside the Titanic, and with the help of CGI, audiences can view the ship's original appearance superimposed on the deep-dive images. 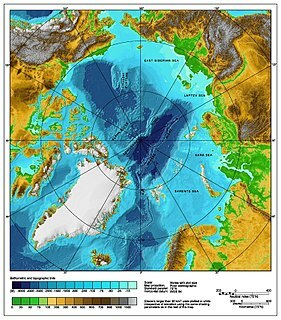 The Lomonosov Ridge is an unusual underwater ridge of continental crust in the Arctic Ocean. It spans 1,800 kilometres (1,100 mi) between the New Siberian Islands over the central part of the ocean to Ellesmere Island of the Canadian Arctic Archipelago. The ridge divides the Arctic Basin into the Eurasian Basin and the Amerasian Basin. The width of the Lomonosov Ridge varies from 60 to 200 kilometres. It rises 3,300 to 3,700 metres above the 4,200-metre (13,800 ft) deep seabed. The minimum depth of the ocean above the ridge is less than 400 metres (1,300 ft). Slopes of the ridge are relatively steep, broken up by canyons, and covered with layers of silt. The R/V Akademik Mstislav Keldysh is a 6,240 ton Russian scientific research vessel. It has made over 50 voyages, and is best known as the support vessel of the Mir submersibles. The vessel is owned by the Shirshov Institute of Oceanology of the Russian Academy of Sciences in Moscow, and is homeported in Kaliningrad on the Baltic Sea. Named after the Soviet mathematician Mstislav Keldysh, it usually has 90 people on board. Among its facilities are 17 laboratories and a library. The Finnish maritime cluster is a cluster of Finnish companies in maritime industries. In 2016 the total turnover was estimated at 13 billion euros and it employed 48,000 people. Richie Kohler is an American technical wreck diver and shipwreck historian who has been diving and exploring shipwrecks since 1980. Together with John Chatterton, Kohler was one of the co-hosts of the television series Deep Sea Detectives on the History Channel and is also a consultant for the film and television industry on shipwreck and diving projects. RV Akademik Fyodorov is a Russian scientific diesel-electric research vessel, the flagship of the Russian polar research fleet. 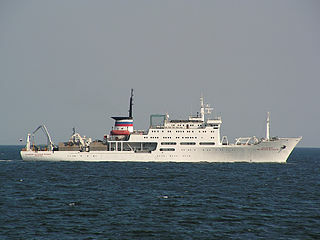 It was built in Rauma, Finland for the Soviet Union and completed on 8 September 1987. It started operations on 24 October 1987, in the USSR. The ship was named after a Soviet polar explorer, academician of the USSR Academy of Sciences Evgeny Fyodorov, who worked on the first Soviet manned drifting ice station North Pole-1. Anatoly Mikhailovich Sagalevich is a Russian explorer, who works at the Shirshov Institute of Oceanology of the Russian Academy of Sciences since 1965. Pisces class submersibles are three person research deep-submergence vehicles designed and built by Hyco International Hydrodynamics of North Vancouver in British Columbia with a maximum operating depth of 2,000 m (6,560 ft). The vehicles have multiple view ports, sample collecting, environmental sensing, and instrument placement capabilities. The pressure hull has a 7 ft (2.1 m) inside diameter and is made of HY-100 steel with 3 forward-looking acrylic windows, 6 in (15 cm) in diameter. Designed by Alan Trice, the Pisces series of submersibles are representative of early manned submersibles built in the late 1960s and were proven workhorses in offshore exploration and oceanographic research. Pisces II was the first production model of the design and was completed in 1968, with 9 more Pisces subs built before the manufacturer folded in the late 1970s. Titanica is a 1992 IMAX documentary film about the RMS Titanic. The film was directed by Stephen Low and narrated by Cedric Smith, Anatoly Sagalevich and Ralph White. The film mostly focuses on footage taken at the wreck of the RMS Titanic, also featuring footage of the expedition crew searching the wreck as well as interviews with Titanic survivors Frank John William Goldsmith and Eva Hart. 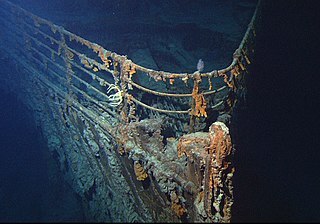 Using Eva and the crew members, Low conveys the voice of the documentary by showing the Titanic's wreckage as a graveyard which is to be respected and treated with caution and care. It was the second feature length IMAX film released, following Stones at the Max in 1991. An edited 40 minute version of the film was also later released for IMAX theatres in 1995; this version had new narration by Leonard Nimoy, though it retains most of White's narration. This edited version later became the basis for another edited version released in 1997, featuring 27 more minutes of interviews with Ralph White, Emory Kristof, and other experts.